NEW YORK – The New York Committee for Human Rights in the Philippines (NYCHRP) vehemently condemns the torture and extrajudicial killings of Emerito Samarca, the Executive Director of the Alternative Learning Center for Agricultural and Livelihood Development (ALCADEV), Dionel Campos, the Chairperson of Malahutayong Pakigbisog Alang sa Sumusunod (MAPASU), and his cousin Bello Sinzo in Sitio Han-ayan and its surrounding communities in Surigao Del Sur, Mindanao by the suspected elements of the 36th Infantry Battalion of the Armed Forces of the Philippines (AFP) and their bandit paramilitary group of Marcos Bocales between August 29th and September 1st, 2015. On August 29th, the paramilitary group of Marcos Bocales entered ALCADEV and set up camp, threatening to massacre the community if they did not evacuate in two days. On August 31st, they burned down the MAPASU community cooperative and indiscriminately fired into the civilian community. Witnesses saw suspected military forces bring Emerito Samarca into a classroom with his neck, hands, and feet tied. That evening, teachers from the school and residents in Sitio Han-ayan moved to Km16, hoping that it would be safer. At around 4:00am on September 1st, civilians were forced out of their homes by the military and ordered to go to the center of the community. Dionel Campos and Bello Sinzo were shot at this time by Loloy and Bobby Tejero of the paramilitary group of Marcos Bocales. The military then confiscated all civilians’ cell phones and cameras and forced them to evacuate the area. The lifeless body of Emerito Samarcas was later discovered in the classroom with a stab wound. Indigenous Lumad communities in Mindanao have been systematically denied access to education and forcibly displaced from their ancestral lands through the use of violent intimidation tactics and threats ordered by the current administration of President Benigno S. Aquino III. B.S. Aquino implements a counterinsurgency program called Oplan Bayanihan, which is virtually a copy of former President Gloria Macapagal Arroyo’s Oplan Bantay Laya under a different name. Both counterinsurgency programs are modeled after the United States’ Counterinsurgency Guide which was released in 2009. These plans manifest in intimidation, torture, and extrajudicial killings of peoples’ organizations that resist displacement and provide basic social services to neglected, poor communities who are wrongfully labeled as terrorist organizations. The Philippine government, through the AFP and its paramilitary units have employed the tactic of “red-tagging” peoples’ organizations as elements of the Communist Party of the Philippines (CPP) and its armed wing the New People’s Army (NPA), with whom the Philippine government has been in a civil war for 46 years, in order to justify violently quashing the organizations’ programs. This proves that the Philippine government’s true interest is to protect the interests of big business and landlords who the peoples’ organizations oppose. The systematic decimation of rural communities in Mindanao is the Philippine government’s chosen strategy to protect the region’s rich natural resources for greedy corporate plunderers at the expense of the subsistence of the Filipino people, especially its indigenous tribes. ALCADEV was formed by MAPASU and the Tribal Filipino Program of Surigao del Sur (TRIPFSS) in response to the lack of educational access for Lumad people who live in remote rural areas in Mindanao. The school provides secondary education to Lumad children in the surrounding communities. In addition to basic courses in literacy and math, the school offers courses in sustainable agricultural production and the basic human rights entitled to Lumad communities. Because ALCADEV teaches students how to advocate for the rights of their people, the AFP has red-tagged it as training grounds for the NPA in order to crush the communities’ self-determination to challenge oppressive policies and entities that the Philippine government protects. At this moment, 2,000 Lumads from the community are evacuating to a safer location. As long as people are forced to evacuate their homes due to military harassment and indigenous people are being denied rights to a free, relevant, and uninterrupted education and livelihood, then the AFP is violating international humanitarian laws, many of which the Philippines is a signatory, namely the United Nations Declaration on the Rights of Indigenous Peoples (A/RES/61/295) and the Universal Declaration of Human Rights. NYCHRP denounces and condemns all actions taken by B.S Aquino, as the Commander-in-Chief of the AFP, that harass and kill indigenous people and attempt to deny them access to their basic right to education. As a U.S.-based organization, NYCHRP recognizes the role that the United States plays in these continual human rights abuses wreaked upon the Filipino people. NYCHRP calls for the end to U.S. military aid to the Philippines, the Visiting Forces Agreement, and the Enhanced Defense Cooperation Agreement which allow U.S. soldiers to train and bolster the AFP’s operations that target civilians and violate their human rights. NYCHRP calls upon all defenders of peace, justice, and human rights around the world to stand with us in international solidarity and demand justice for Emerito Samarca, Dionel Campos, Bello Sinzo, and all the community members of Han-ayan and Km16 who are currently being evacuated. JUSTICE FOR EMERITO SAMARCA, DIONEL CAMPOS, AND BELLO SINZO! IMMEDIATELY DISBAND AND PROSECUTE THE KILLERS! STOP THE COLLUSION OF THE PARAMILITARY FORCES AND THE ARMED FORCES OF THE PHILIPPINES! EMAIL your concerns to the Philippine Government by writing to the contacts listed below. An email template can be found at the bottom. 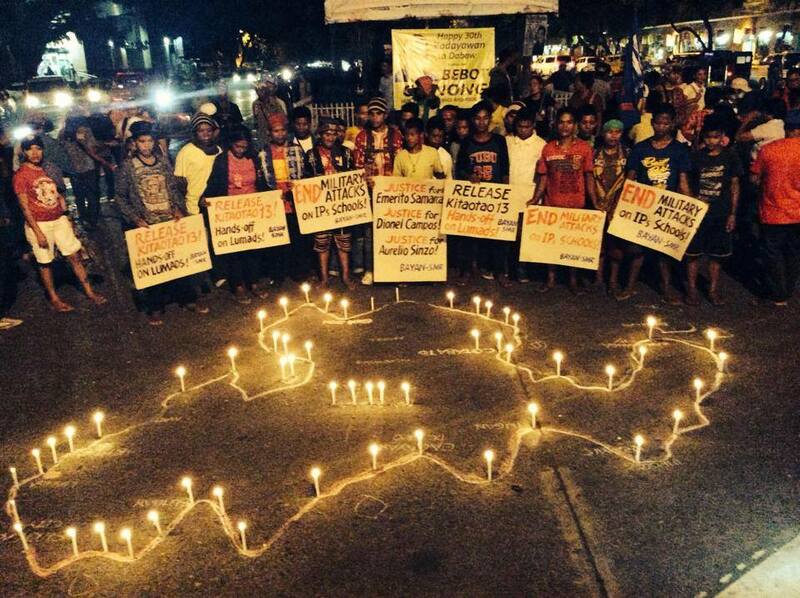 BARUG KATUNGOD MINDANAO (Mindanao, Stand for Human Rights!) is a broad island-wide human rights network of lawyers, church people, academics, artists, youth and students, women, child rights advocates, Lumad rights workers, Moro human rights workers, health professionals, journalists, and other human rights workers and defenders. It aims to serve as a human rights campaign center in Mindanao by drawing up island-wide statistics and analysis of human rights trends and issues; provide capacity-building trainings to human rights workers and human rights defenders in the regions; and strengthen human rights advocacy and mobilizations at Mindanao, national, and international levels. I/ your organization join the Filipino human rights defenders, educators, people’s organizations and international rights groups in strongly condemning the barbaric and inhuman act of killing of Emerito Samarca, executive director of Alternative Learning Center for Agricultural and Livelihood Development (ALCADEV), a self-initiated school for the Lumad. He was found dead on September 1, with a stab wound inside one of the classrooms in the school compound in Han-ayan, Lianga, Surigao del Sur. Also killed in Km. 16, some three kilometres from Han-ayan, were Dionel Campos, chairperson of Malahutayong Pakigbisog Alang sa Sumusunod (MAPASU) and his cousin, Bello Sinzo. The two were shot by members of paramilitary group of Marcos Bocales in the presence of their community members in Km. 16. According to the report we received from KARAPATAN, a network monitoring human rights, two days prior to the killing, the paramilitary group of Marcos Bocales and elements of the 36th IB encamped at the ALCADEV school compound and occupied the function hall and parts of the school grounds. During the encampment, the paramilitary group of Marcos Bocales threatened the school faculty members, staff and community members that they will massacre the community if the people will not leave in two days. On August 31, the paramilitary group of Marcos Bocales burned down the community cooperative store of MAPASU while indiscriminately firing around the community. Emerito Samarca, according to the report was held and detained by some armed members of the paramilitary group of Marcos Bocales before he was killed. He was last seen tied around the neck, his hands and feet were also tied. He was brought to one of the classrooms. The paramilitary group of Marcos Bocales also confiscated all cellphones and cameras from the residents and ALCADEV staff and remaining visitors in the community. According to KARAPATAN, the Bagani paramilitary and the 36th IB has long been accusing self-help Lumad school ALCADEV as NPA school, killing the teachers and organizers in the community, consequently depriving the Lumad of their education. Mr. President, as Commander-in-Chief of the Armed Forces of the Philippines, we ask that you order an immediate pull-out of the 36th Infantry Battalion in Lumad communities in Lianga, Surigao del Sur and the dismantling of paramilitary groups in this dirty war against the Filipino people. To immediately form an independent fact-finding and investigation team composed of representatives from human rights groups, the Church, local government, and the Commission on Human Rights to look into these incidents of human rights violations; and, to arrest and prosecute the perpetrators. Finally we call on your administration and all its institutions to uphold the basic human rights of the citizens whom you have sworn to serve.